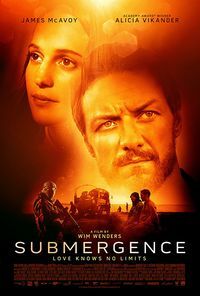 Despite the fact that you have two big stars in this film (Alicia Vikander and James McAvoy), this film which premiered at the Toronto Film Festival last year got mixed reviews. From my vantage point, I think that if medium is the "massage" in Marshall McLuhan´s iconic phrase, then Wenders´ film is an A. But contentwise, based on J.M. Ledgard´s novel, I would tend to have doubts. Maybe the novel expresses itself better, but translated into film, especially with the anti-jihadist mood these days, it makes you feel queasy seeing in the film empathy towards the jihadists. The second angle I didn´t feel comfortable with was the constant philosophical reminder of life being submergent, as though reflecting consistently on the Gorkian lower depths. If the direction had gone lighter and not pro-jihadist, this film would not have had mixed reviews.